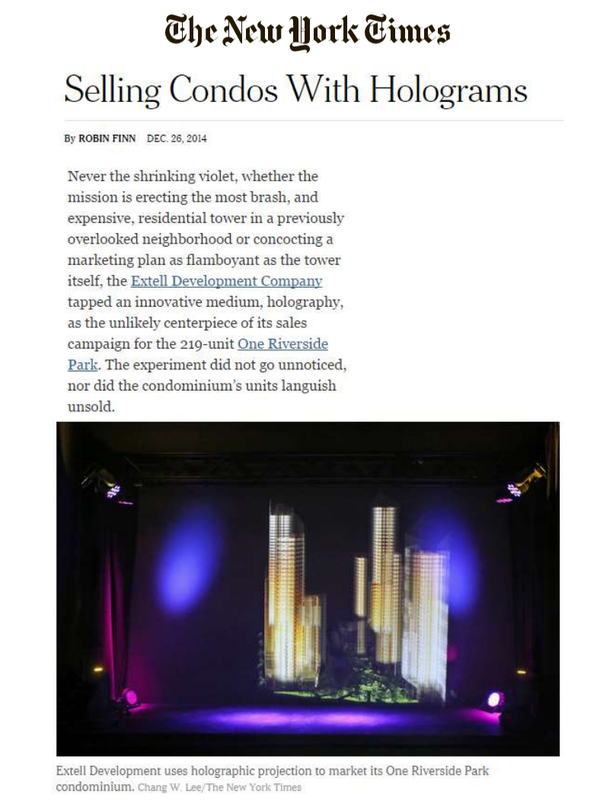 Never the shrinking violet, whether the mission is erecting the most brash, and expensive, residential tower in a previously overlooked neighborhood or concocting a marketing plan as flamboyant as the tower itself, the Extell Development Company tapped an innovative medium, holography, as the unlikely centerpiece of its sales campaign for the 219-unit One Riverside Park. The experiment did not go unnoticed, nor did the condominium’s units languish unsold. Extell pioneered the persuasive power of virtual views in marketing its Midtown juggernaut, One57, the 90-story glass spike perfectly positioned to capture Central Park vistas. In the case of One Riverside, a 35-story condominium at West 62nd Street that is the fifth and final piece of its Riverside South residential complex off Riverside Boulevard, the company elected to conjure a seductive specter of the evolving riverfront neighborhood with an immersive theatrical production staged by holograms. Leave it to laser beams to tease the eye into believing it sees, and covets, the intangible in the guise of an as-yet unbuilt or unfinished luxury domicile. To help market One Riverside, Extell recruited Musion, a British company with a patented three-dimensional holographic projection system. The system debuted at the Swarovski museum in Austria in 1996 and attained viral Internet status with a “digital resurrection” of the deceased rapper Tupac Shakur at the 2012 Coachella Valley Music and Arts Festival. For One Riverside, Musion programmed a digital celebration of a nascent community. “At Extell, we’re constantly looking for new techniques to help us sell our buildings,” said Tamar Rothenberg, a vice president of marketing. “One57 was quite innovative for the way we displayed real-time views from future units before the tower existed.” According to Ms. Rothenberg, the challenge posed by One Riverside was finding the best way to convey the feel of an entire neighborhood that has been evolving for 10 years but is, with the multifaceted Riverside Center coming to fruition with a park, school and retail, about to take off. “There’s only so much you can do in a sales center, but if a picture is worth a thousand words, we like to think a hologram is worth a million words.” In other words, 3-D beats 2-D. The hologram presentation includes an overview of the waterfront neighborhood (the five Extell buildings on the Riverside South plaza unfurl in succession like a time-elapse cocoon-to-butterfly birth simulation), a trip inside the new complex, now 85 percent sold with remaining units ranging from $3.6 to $25 million, and a dazzling display of its amenities. Visitors who find themselves so thoroughly immersed in the presentation that they opt to buy an actual piece of the picture — occupancy is scheduled to begin in late 2015 — are ushered downstairs to the sales center, where they can study specific floor plans and revisit views and finishes. At the conclusion of the sales cycle, the holograms, which have attracted repeat viewers, will likely be recycled, not retired. Extell is not the only developer using hologram technology to tempt buyers. For the Ritz-Carlton Residences in Miami Beach, where units are priced from $2 million to $40 million, the developer, Lionheart Capital, assembled a $3 million sales gallery that has, in addition to a private screening room, exhibit wall and dioramas, two holograms conceptualized by the design agency DBox. The focus, unsurprisingly, is the opulent outdoor pool area: One hologram depicts the creation of the pool deck, and the other takes onlookers through the main entrance and into the waterside lobby. The holographic goal: Convince potential future residents of the immersive relaxation experience that awaits them at poolside, or, by association, upstairs in their luxury condos.